Want to create beautiful images to capture newborns in a perfect photograph? Want a tool that is that is easy to use comfortable and safe for the baby? Get the New and Improved Version of this prop We listened to concerns about similar sets and produced an improved product we think you will love! In this version 2.0 of the popular Donut shaped pillow set we provide you with a high quality product that was well thought out from a photographer's perspective as well as a parent who wants their child to be safe. After all Props should make your job easier not more difficult and never put the newborn at risk Select the Best.Purchase this new version of the classic prop pillow. ✿ Changed the fabric to a more comfortable yet still very durable one. Similar products have either too coarse a material that is uncomfortable or a thin sheet like cotton that shows every wrinkle & isn't ideal for a prop pillow. Note: you may still want to utilize a blanket or fabric over the pillows to get your desired look. ✿ Removed the zipper from the 3 smaller positioning pillows for comfort. The set has 4 pillows for use in photographing newborn babies - The main pillow is Donut shaped & 3 smaller positioning pillows. See photo for sizes This is an improved version over other similar sets you see on Amazon. For use with newborns 0-4 months. 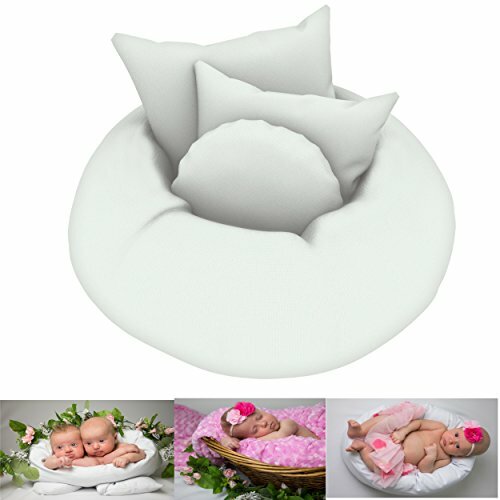 If you are looking at this style Photography Posing pillow set make sure you get this NEWER version. Whether you are a pro photographer or a doting parent of a newly arrived baby this set will help you capture incredible images of that precious little miracle. ✿Only available at Cutest Baby! Note - This set includes 1 large Donut / circle shaped Pillow and 3 smaller pillows. Other outfits, props, and babies aren't included  . If you have any questions about this product by Cutest Baby, contact us by completing and submitting the form below. If you are looking for a specif part number, please include it with your message. Original Stick'Nsnap (TM) 17 Baby Monthly Necktie Onesie Stickers -"Happy Heroes" (TM) Milestones for 12 Months +5 Bonus Milestones - Great Baby Shower Gift!